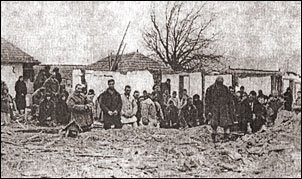 During this period, the True Orthodox Christians of Romania were also undergoing persecution. Metropolitan Vlasie writes: “The Romanian King Charles II left his wife Maria, who came from Constantinople and was married again to a Jewess. Charles II did not want to abandon his throne, but was forced to abdicate since he had married a non-Christian. His son Michael was only 8 years old, so a regent was needed. 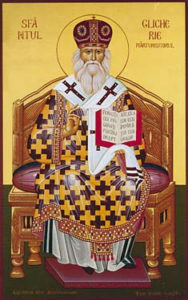 Patriarch Miron became the regent. The political circumstances of that time were complicated by the fact that the government had been dissolved, and in order to maintain the constitution the regent had to become Prime Minister. Thus in 1936 the patriarch became both regent and Prime Minister – the complete master of the country. He had the power to annihilate our Church, and he used it in full measure: he destroyed all our churches and arrested all the clergy, the monastics and the leaders of the Old Calendarist groups. In Bessarabia, writes Glazkov, “the priests Fathers Boris Binetsky, Demetrius Stitskevich and Vladimir Polyakov were put on trial for serving according to the old style. The establishment of the dictatorship of King Charles II in Romania in February, 1938 was accompanied by an increase of persecution for national and calendarist reasons. The point was that the Romanian kings were of Austrian origin and were only formally Orthodox Christians, they were not much concerned for the fate of Romania, the people and the Church. On the whole they were only a façade behind which various civil and ecclesiastical functionaries committed their deeds of darkness. “In 1939 Fr. Glycerius found himself, as the result of the denunciation of a new calendarist priest, in a special camp for legionaires in Miercurea Ciuc. In November of the same year there came an order to divide all the prisoners into two parts and shoot one part and then the other. When the first group had been shot, Fr. Glycerius and several legionaires who were in the second group prayed a thanksgiving moleben to the Lord God and the Mother of God for counting them worthy of death in the Orthodox faith. The Lord worked a miracle – suddenly there arrived a governmental order decreeing clemency. “[Patriarch Miron Cristea] ordered all of the churches of the True Orthodox Christians razed, and imprisoned any cleric or monastic who refused to submit to his authority. The monks and nuns were incarcerated in two monasteries, where they were treated with unheard of barbarity. Some of them, such as Hieromonk Pambo, founder of the Monastery of Dobru (which was demolished and rebuilt three times), met with a martyr’s end. During the destruction of the Monastery of Cucova, five lay people were thrown into the monastery well and drowned. By such tactics the Patriarch wished to rid himself of the Old Calendarist problem! The Communists were generally more tolerant towards the Old Calendarists, but this does not mean that persecutions ceased. Likewise, the Old Calendar Church still had no legal status. The life of Bishop Demosten (Ionita) perhaps best illustrates what the Old Calendar clergy had to endure. Bishop Demosten was born on July 1 (n.s. ), 1927, in the city of Covasna, and was given the name Dmitri at baptism. In 1951, Dmitri entered the Holy Transfiguration Monastery in Slatioara. From 1952-54, he served his term in the army, after which he returned to the monastery and was tonsured a monk under Metropolitan Silvester in 1955. The following year Metropolitan Galaction ordained him to the diaconate, and in 1957 Metropolitan Glicherie ordained him to the priesthood. Within a month after his ordination, Fr. Demosten went to Bucharest to assist Bishop Evloghie who was in hiding. There he was betrayed by an Old Calendar priest and arrested. The authorities demanded that Fr. Demosten reveal the whereabouts of the bishop, which he refused. Interrogator: What activity does Glicherie have in this country? What measures does he plan to take against the Communists? Fr. Demosten: The Metropolitan teaches us to work, pray, and obey. Interrogator: Where are you hiding your guns? Fr. Demosten: Our guns are our church books. Chief Interrogator: Why doesn’t he tell us where the guns are? Hang him! Fr. Demosten spent the next seven years in concentration camps. His experiences could comprise a chapter of Solzhenitsyn’s Gulag Archipelago. The prisoners were starved, tortured, and denied any form of comfort. At one point Fr. Demosten was so exhausted that he could not even remember the Lord’s Prayer. In 1959 the authorities promised all religious prisoners from his camp freedom if they signed a declaration of apostasy. Out of 2,000 prisoners only 90 agreed to sign. In the prison camp in Salcia, Fr. Demosten saw prisoners being trampled by horses as he and others worked on building canals and other projects in the freezing winter. Many years later, Fr. Demosten met one of the prison guards of Salcia, who informed him that it was indeed a miracle he had survived, for the guards had orders that no one was to leave that camp alive. from Orthodox Life, Vol. 42, No. 5, Oct.-Nov. 1992, pp. 11-17. Pokój i nieprzejednanie – abp Abercjusz Tauszew – 1957 r.
O Patriarchacie Moskiewskim – Arcybiskup Awierkij (Tauszew) 1976 r.
Kim tak naprawdę był o. Serafin Rose? Katakumbowa homilia na święto Bożego Narodzenia w ZSRR – 1933 r.
Are you in The True Church of Christ?